I know a significant number of you see a lot more potential in this game but keep in mind, nothing is lost. We’ve built a number of systems, pipelines, and mechanics that will absolutely be used again (and should eventually be available to you through the project files). This isn’t the end of the CAT Interstellar universe either. Earth is still a frozen wasteland with a population of just under a billion people. All of them starving for a new home. There are half a million androids in geostationary limbo with no place to call their own and no task to focus their, so called, sub-sentient minds. The contracting company, CAT Interstellar, has failed to terraform Mars and they are desperately looking opportunities to exploit. A massive communications array on the Moon that connects all outposts and habitats in the solar system is beginning to become self-aware. Androids 388 and 461 aren’t ready to abandon Android 42 if there’s a chance he’s still alive. All while the United Nations Common (UNC), Earth’s loosely agreed on government, is trying to ensure everything doesn’t come apart at the seams. Key Rebinding is back online!!! I’ve added a VR branch for alpha testing. Thank you for your patience with this. To gain access go to your Steam Library, Right-click CAT Interstellar and select Properties. Inside the properties window select the BETAS tab. You Should see a drop down with vr_alpha – VR Testing. Select this and the game should start to update on its own. Once the download is complete you’ll be able to play. The VR mechanics were rebuilt from scratch and any feedback on the controls or perspectives would be greatly appreciated. I’ve started a new support thread HERE. The first iteration of the project files uploaded as free DLC. It includes the Meshes, Animations, Audio and Code(blueprints) for DOG-V. I’m releasing the files under the Creative Commons License Attribution 4.0 International. You’re free to strip what you need for your own projects but give credit in some form. I’ll update the project with new textures, audio, meshes, and shaders as I replace the ones in-game. The format of the project requires that you have Unreal Engine 4.17.1 installed. I DO take requests so if there’s something in the game you want to know about don’t hesitate to ask. I’ve started a thread specific to the project files here.HERE. I also want to take this opportunity to recognize an Ionized Games employee who went above and beyond what was expected. Ziggy is a junior programmer who has been with us since the founding of Ionized Games. 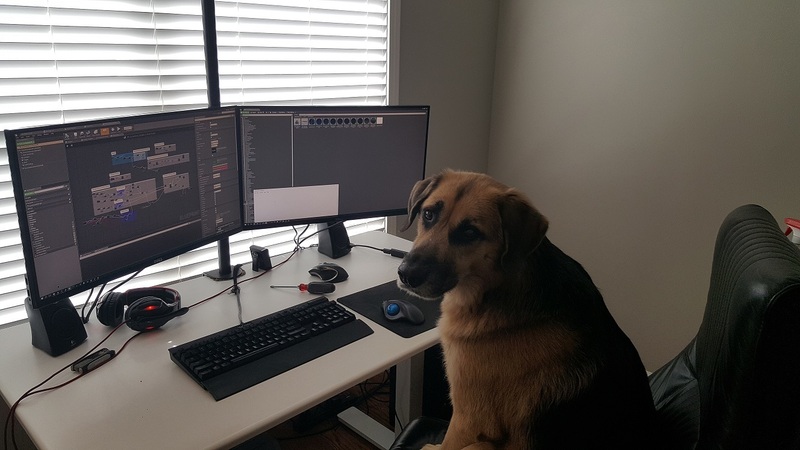 For his efforts in getting this game released he is being promoted to Senior Programmer effective immediately. It’s hard me to wrap my head around just how far this game has come but, one thing is for sure, I couldn’t have done it without your support. I have written and re-written this statement over and over and still can’t think of a way to express my gratitude to you. The best I can do is try to make more and more assets available to you to make your own games. Regardless, thank you again for everything. I look forward to the next installment of whatever story you tell next. Am I completely missing something or is there no tech support page? The Steam forums are the best place for tech support. Let me know what your issue is and I can do a quick search for it. If it’s something new it might be best to start a new thread on the forum and I’ll get right on it. It’s just hard to troubleshoot anything through a messager. Thanks for reaching out about this. Hopefully I can help you quickly resolve the issue and get in the game. Hi. I don’t know if this is the right place for praise, but wherever it may be, I say congrats for the game. It is a very interesting development, quite a professional production and made me a fan for your future projects. Keep it up. P.S. Also I love cats, so always have one in your games!